This temple is atop a hillock. Sridevi (Annanayaki) and Neeladevi (Anantanayaki) are on the right. Bhoodevi (Amrutanayki ) and Jaambavati are on the left of the Lord in the Nindra Narayanan Sannidhi. All idols as also the Sayana Perumal below are of clay and painted and hence no Abhisek is performed. Sengamalathayar has separate sannidhi and Abhishek is performed here. Garudazhwar is seen with serpent and Amruta kalasa. Aniruddha , grandson of Lord Krishna , married Usha at this place. King Chandraketu , who was born a tiger due to a curse, was able to recollect the previous pious birth, worshipped the Lord and obtained Moksha here. The Moolava r is Ninra Naarayanan facing east. The utsavar is Thiruthannkaalappan seen in standing posture. The temple is on a hill. On the right side of the Lord are Sridevi(Anna Naayagi), Neelaadevi (Anantha Naayagi). On the left are Boodevi(Amrutha Naayagi), Jaambavathi. Gaudazhwar is seen with a serpent & amrutha kalasam. Sinc eLord Muruga stayed in this sthalam, it got the name Thiruthankal (Thankal in Tamil - styaed). Lord Krishna's sone Aniruddhan married Ushai at this sthalam. Thaayaar - Sengamala Thaayaar, (Anna Naayagi, Anantha Naayagi, Amrutha naayagi, Jaambavathi). Features Periya Thiruvadi(Lord Garuda) is seen holding the Amrutha Kalascha('The Pot of Nectar') and a serpent. This sanctum sanctorum is located atop a small hillock. The Moolvar of this Divyadesam is Nindra Narayanan. Also called as "Thiruthankaal appan". Moolavar in Nindra thirukkolam facing his thirumagan along the East direction. 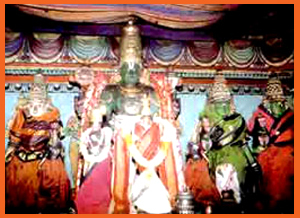 Prathyaksham for Salliya pandiyan, Puli, Sri Vallavan and Sridevi pirattiyaar. This temple is situated in Tamil Nadu and can be reached when travelling through Sri Villiputoor, Virudhunagar. Thiruthankaal railway station, which is found in Virudhunagar - Thenkasi railway lane, and after getting from the station, we can reach the temple. Lodging facility is also available.